Blend peanut butter and condensed milk. add baking mix and vanilla, stirring until smooth (I usually end up using my hands). Roll into 1 inch balls. Roll dough balls in sugar and place on ungreased baking sheets. Bake at 375 degrees for 6-8 minutes – NO LONGER! 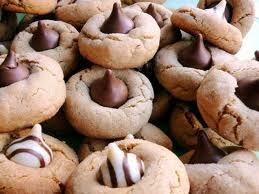 Remove from oven and push Hershey Kiss into the center of each cookie. Remove from pan to cool.